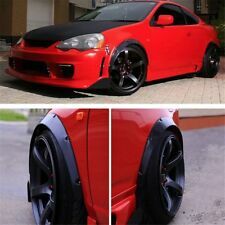 1 4pcs Fender Flares Kit. High quality polyurethane material, non-toxic and high toughness with long life performance. Car Steering Wheel Cover. Material: Polyurethane (PU). Car Seat Covers. Car Accessories. Style Hellcat Style. 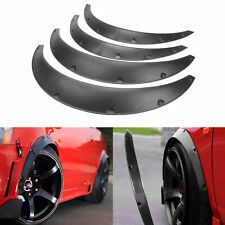 What You'll Receive 1x Set of Fender Flares. Color Unpainted. Material PP - Polypropylene. 2 x Fender Flares Protector. Flexible enough to conform to different types of car body. Material: Rubber. We will reply you within 24- 48 hours. 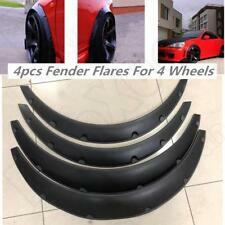 Material: ABS Plastic (Fender Flares) & Stainless Steel (Bolts). 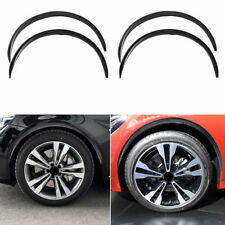 1 x Set of wheel fender flares (left & right) (front & rear). 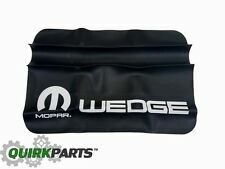 Effectively prevent muddy water splashes to the car body, and protect the surface paint of your car. Style Demon Style. 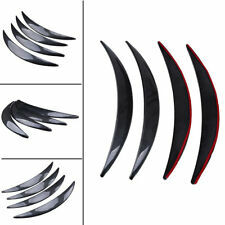 What You'll Receive 1x Set of Fender Flares. Color Unpainted. Material PP - Polypropylene. 4 Car Wheel Eyebrow. Color:Black Carbon Fiber Pattern. Carbon fiber pattern makes your car more 3D energetic. 3D carbon fiber all-inclusive design, better reflect the aesthetic sense. Unique original car radian design, further improve the firmness. 100% brand new Universal Fitment (Please make sure to measure vehicle's fenders before purchasing) Material: Polyurethane (PU) Color: Black Front: approx.2 Pcs : 910.7*392.7*55.7mm Rear: approx. 2 Pcs : 922.1*392.2*54.6mm Please attention：You will need to buy 24 jdm plate screws washers as it does not come with hardware How to select and install 1. Firstly, determine the diameter of the wheel eyebrow of the original car, then select the appropriate wheel eyebrow size; 2. After receiving the goods, put the wheel eyebrow in the original car, and there are 6 screws on the wheel eyebrow to determine the hole position; 3. Punch holes in the original vehicle and the wheel eyebrow and fix with screws. 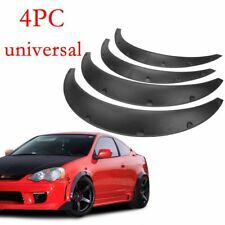 4pcs Black Universal Flexible ABS Auto Fender Flares Car Body Kit For Most Cars Trucks. Material:Polyurethan (Fender Flares) & Stainless Steel (Bolts). 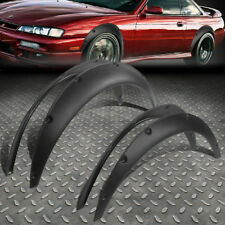 1 x Set of wheel fender flares (left & right) (front & rear).